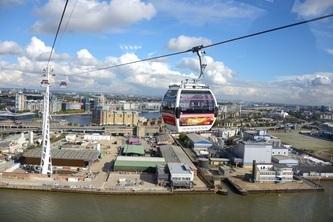 THE Emirates Air Line (also known as the Thames cable car) is a cable car link across the River Thames in London built with sponsorship from the airline Emirates. 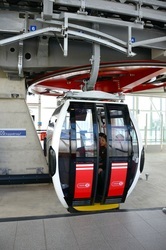 The service opened at 12.00 on 28 June 2012 and is operated by Transport for London. 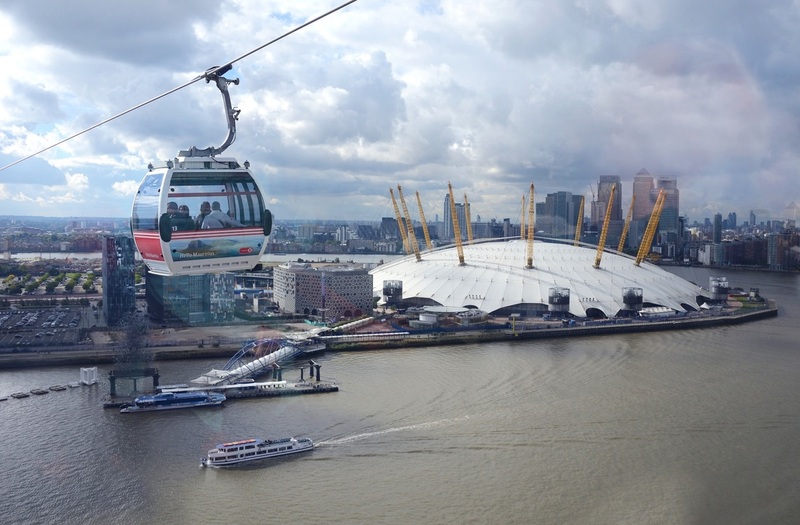 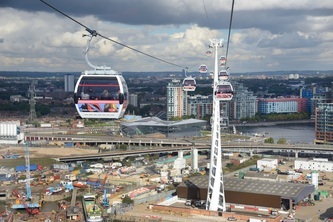 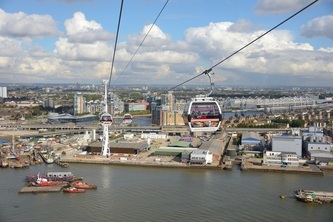 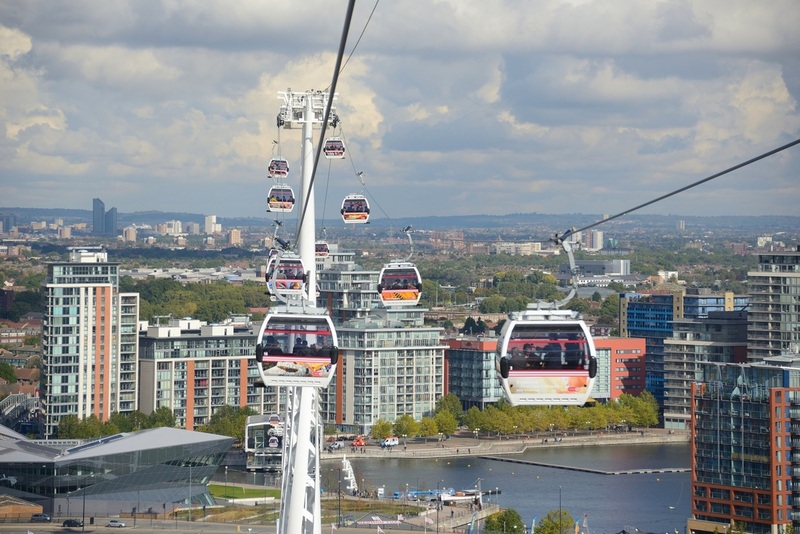 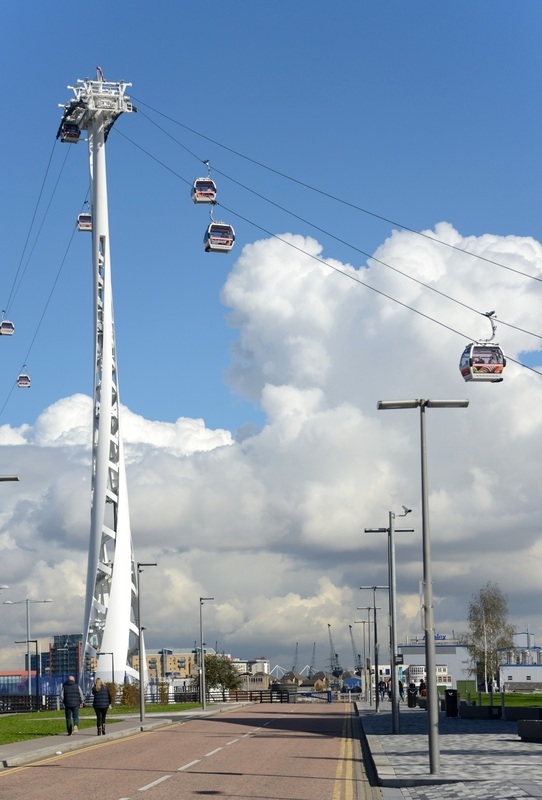 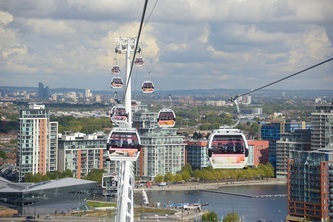 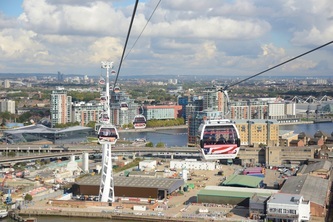 The service, announced in July 2010 and estimated to cost £60 million, comprises a 1-kilometer (0.62 mi) gondola line that crosses the River Thames from the Greenwich Peninsula to the Royal Docks. 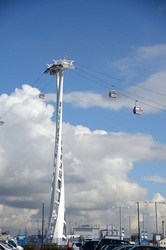 Construction began in August 2011. 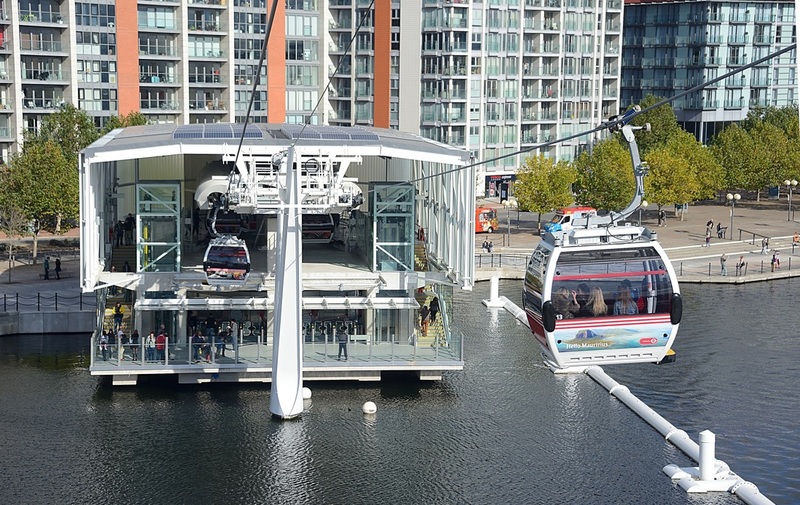 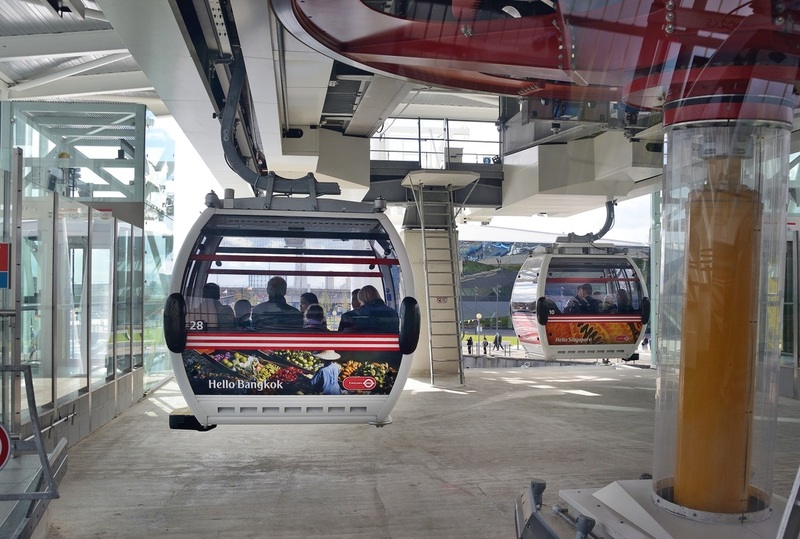 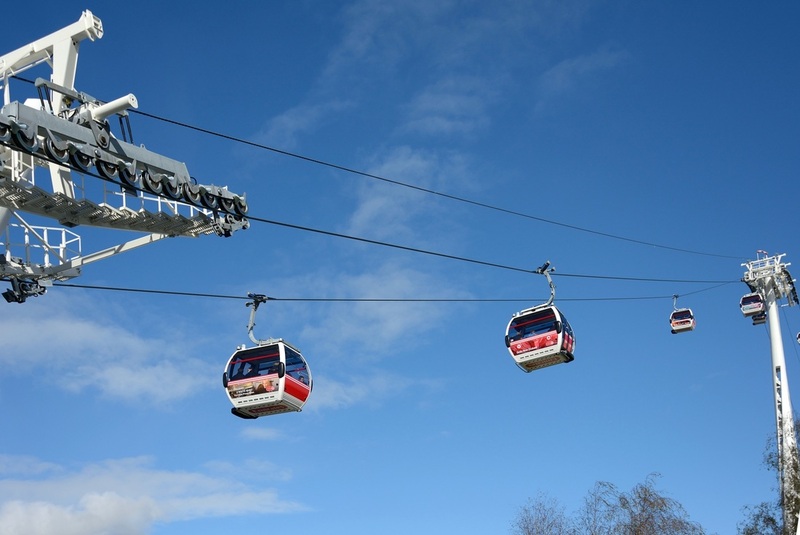 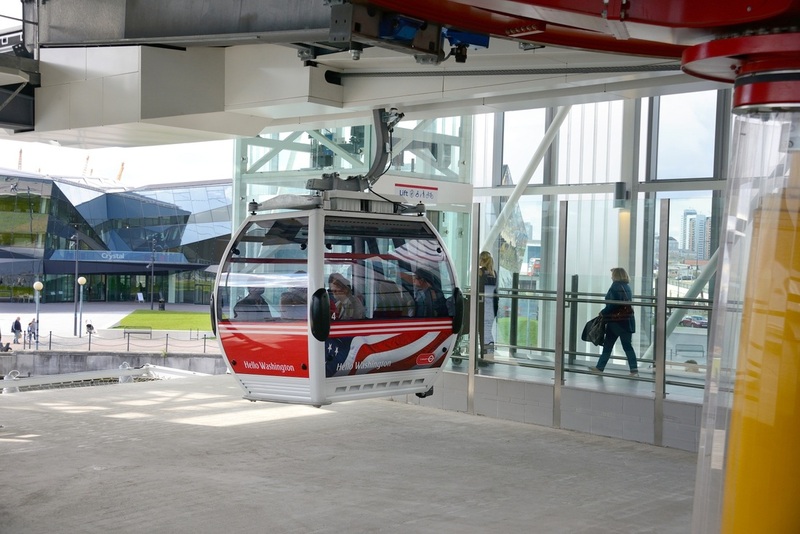 The cable car is based on Monocable Detachable Gondola (MDG) technology, a system which uses a single cable for both propulsion and support. 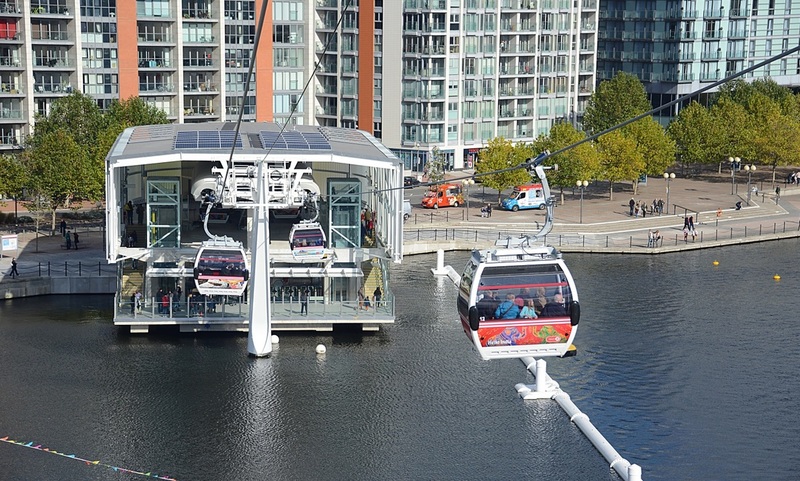 The MDG system is cheaper and quicker to install than a more complex three-cable system which would allow for larger-capacity cars. 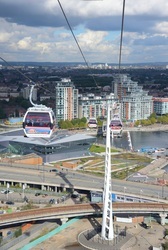 On 4 July 2010, Transport for London (TfL) announced plans to develop a cable car crossing over the River Thames. 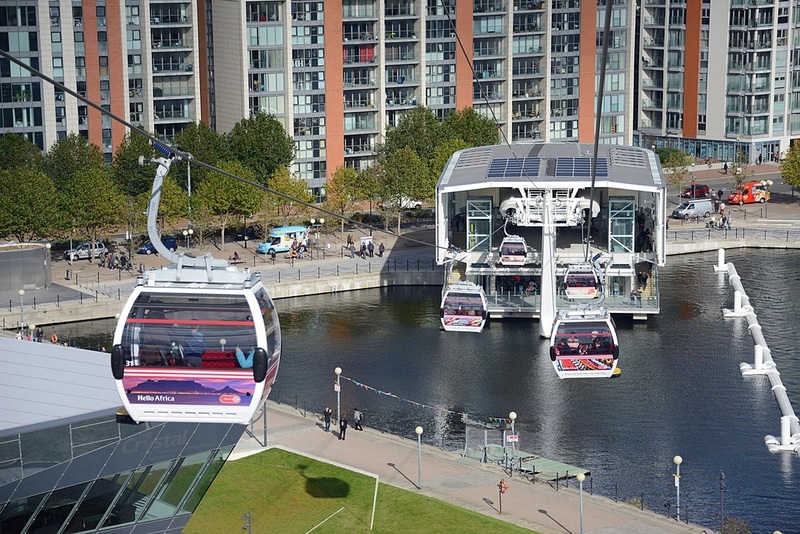 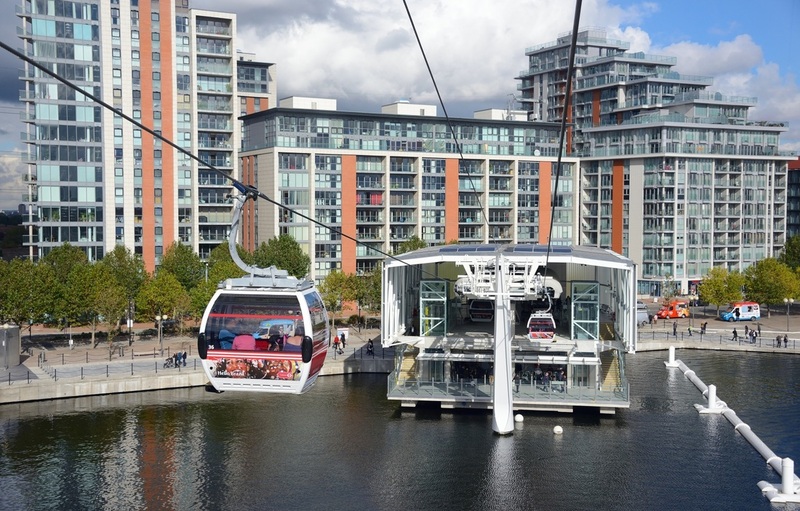 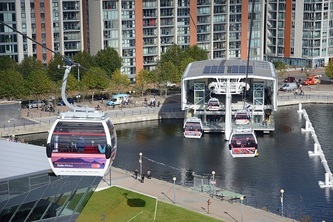 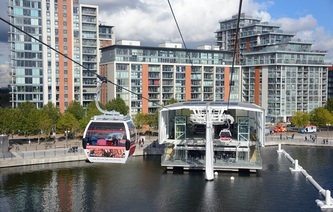 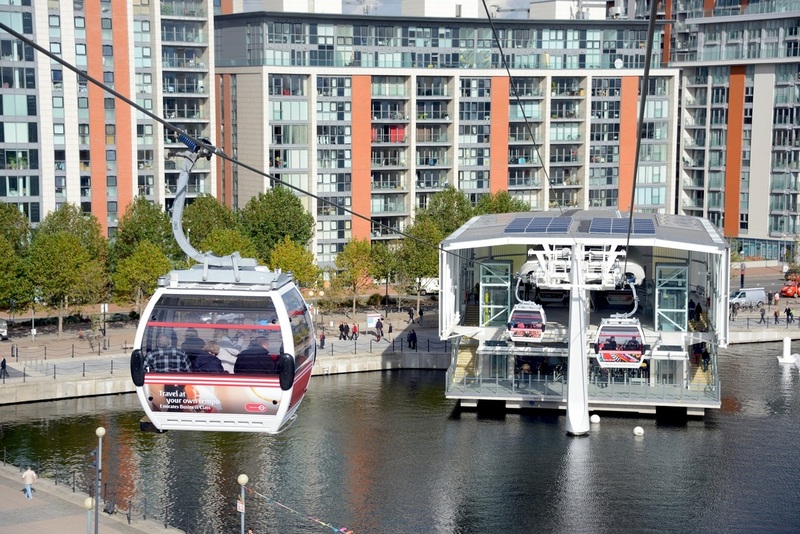 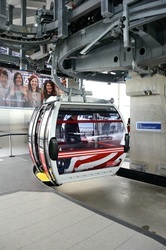 It is the first urban cable car in the United Kingdom. 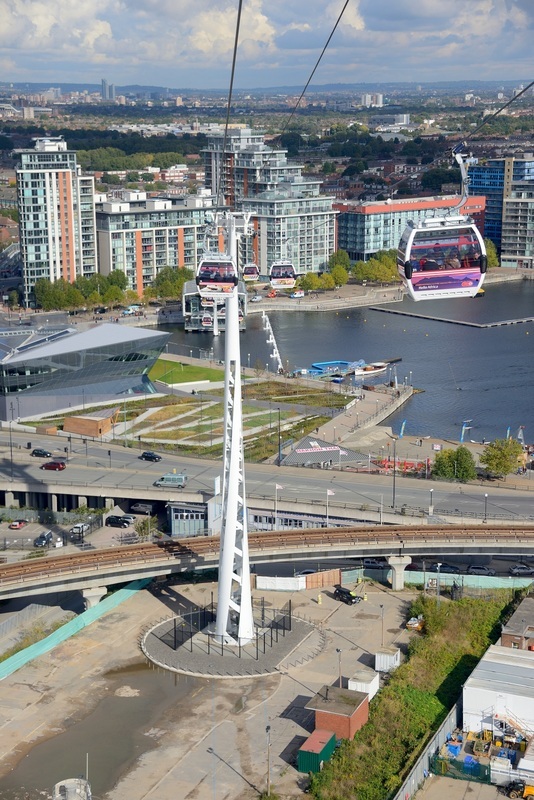 Designed by Wilkinson Eyre Architects, Expedition Engineering and Buro Happold, it crosses the river at a height up to 90 meters (300 ft). 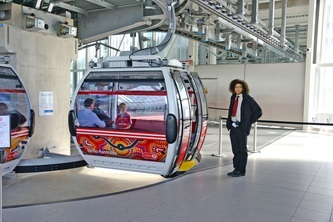 The cable car provides a crossing every 15 seconds, carrying up to 2,500 passengers per hour in each direction. 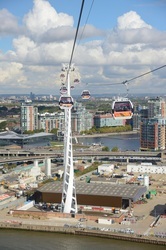 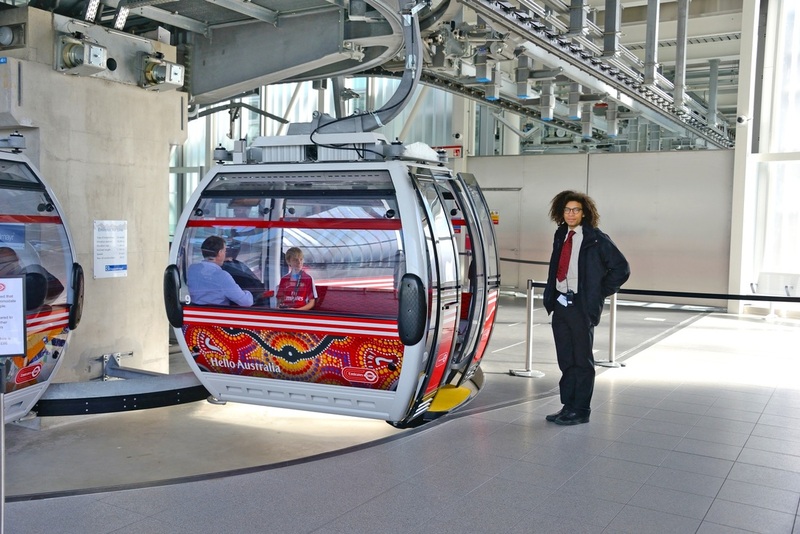 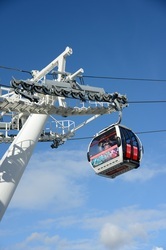 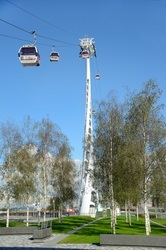 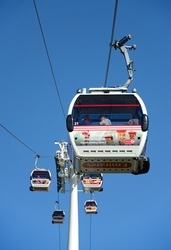 The cable car can also convey bicycles and passengers are able to use Oyster cards to pay for their journeys. 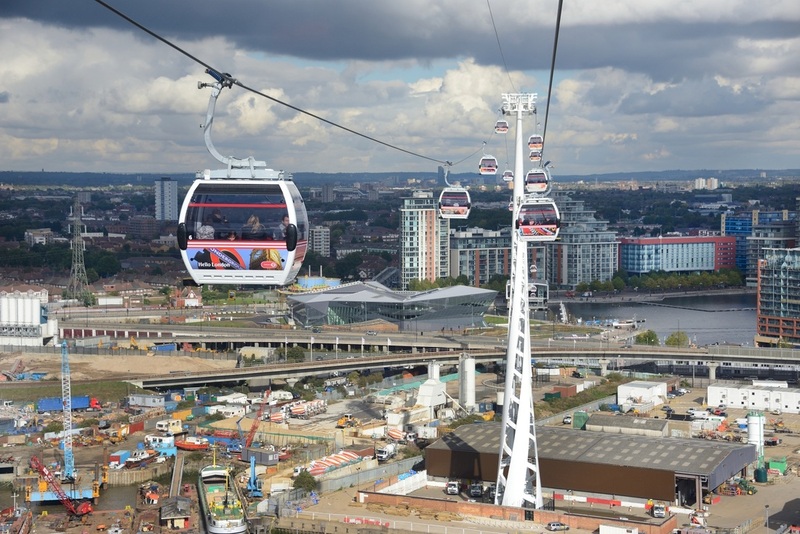 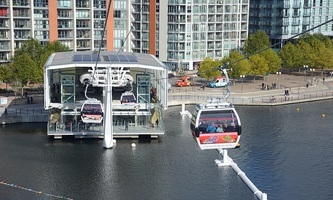 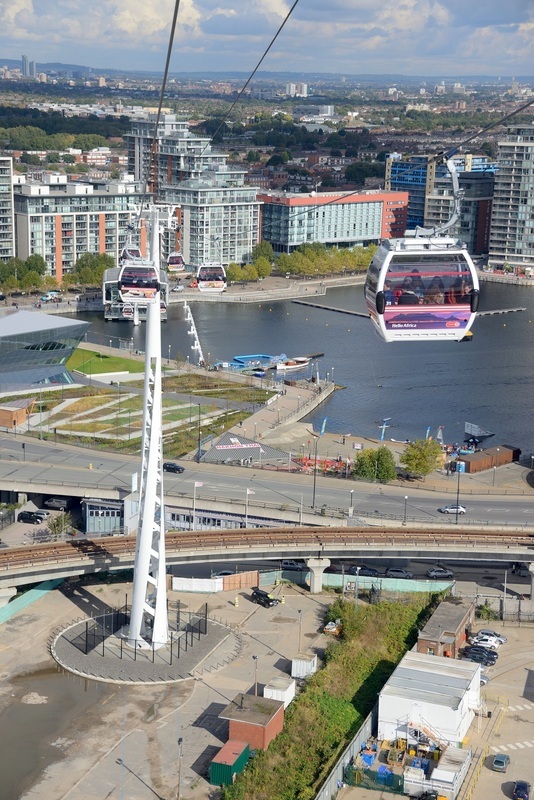 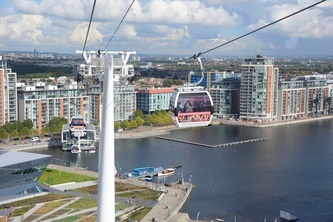 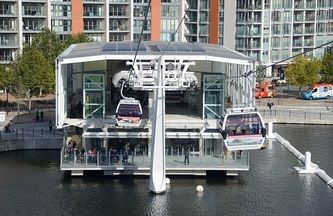 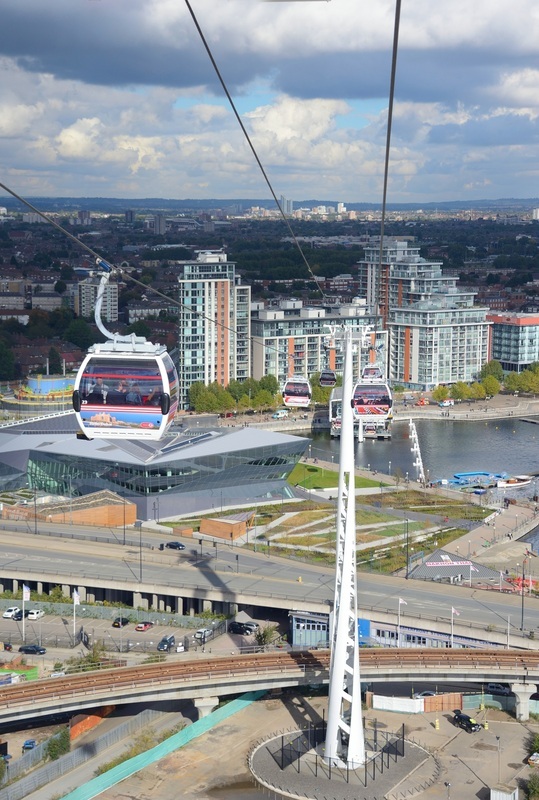 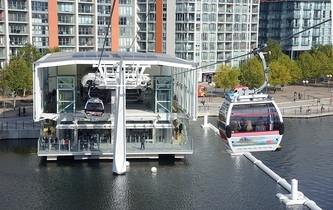 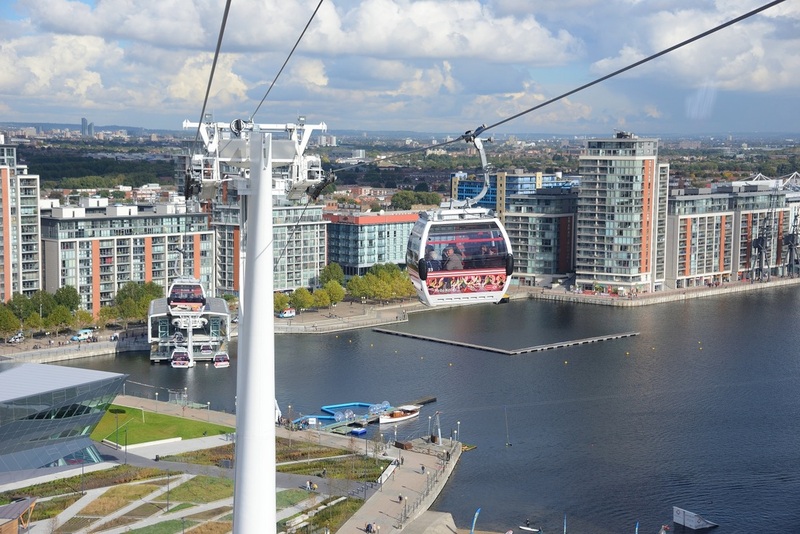 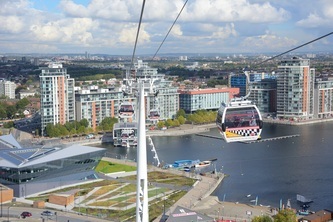 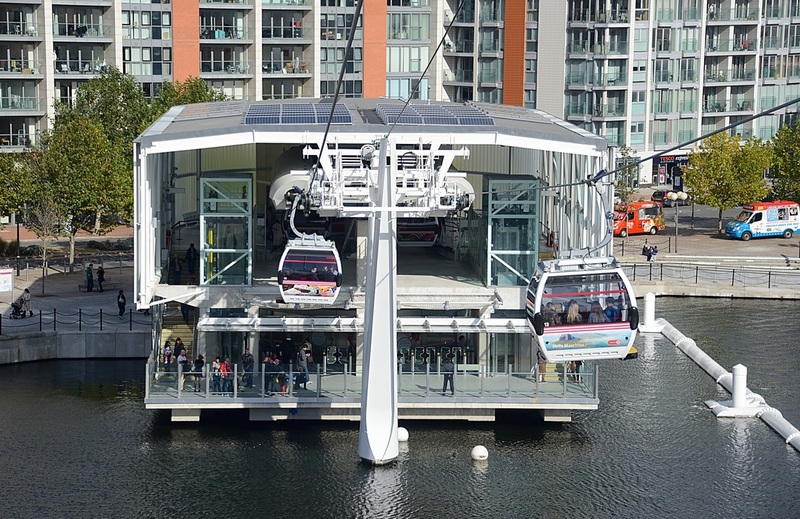 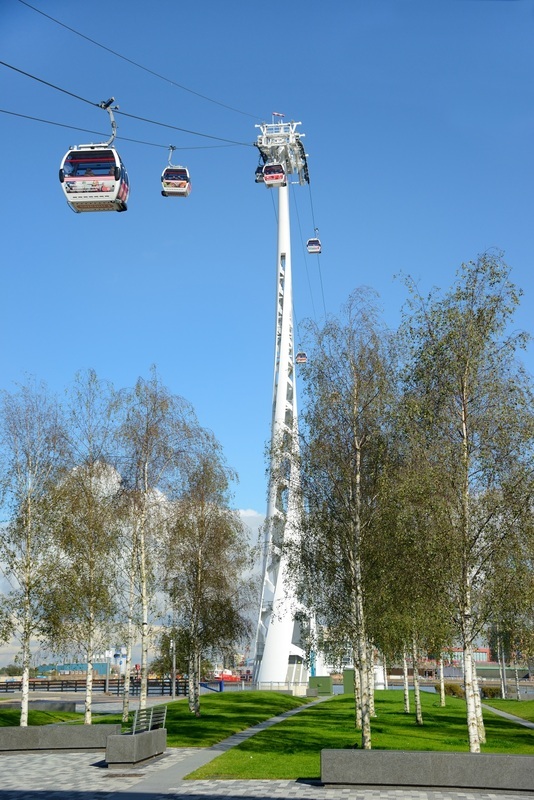 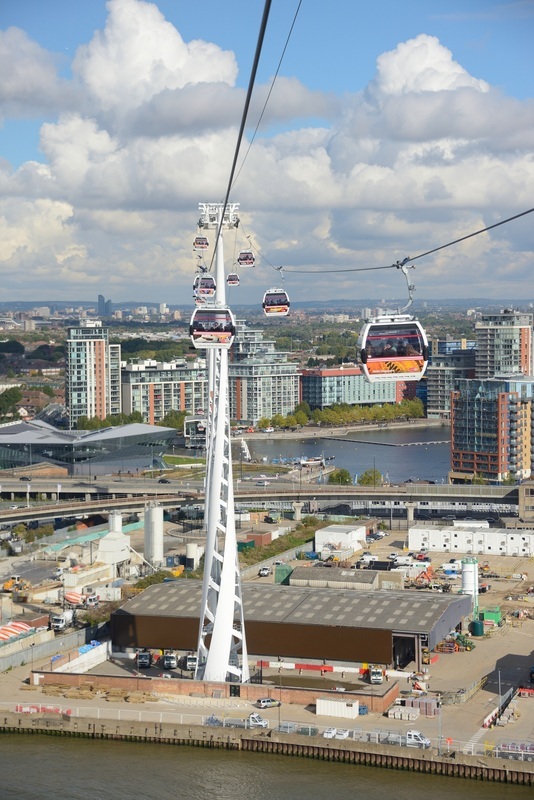 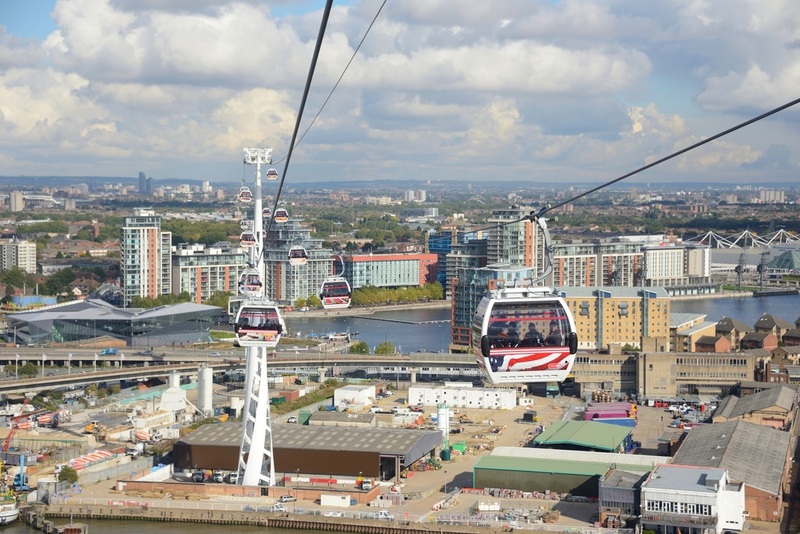 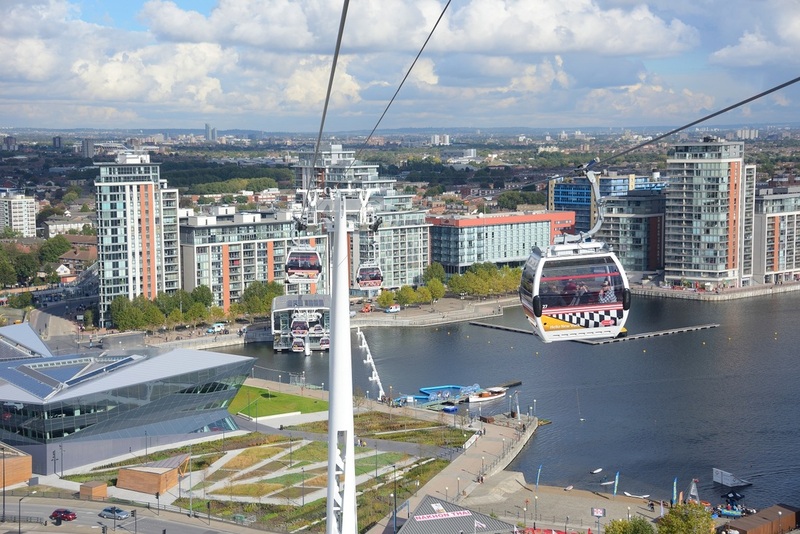 A planning application was submitted to the London Borough of Newham in October 2010 for the 'erection of a cable car for the length of 1,100 metres [3,600 ft] over the River Thames from North Woolwich Peninsula to Royal Victoria Dock at a minimum clearance of 54.1 meters [177 ft] above mean high water'. 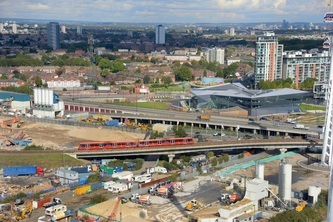 The application listed the structures planned for the service on the north side of the Thames as an 87-meter (285 ft) north main tower at Clyde Wharf, a 66-meter (217 ft) north intermediate tower south of the Docklands Light Railway tracks roughly mid-way between Canning Town and West Silvertown stations, a two-level gondola station and 'boat impact protection' in Royal Victoria Dock. South of the river there is a 60-meter (200 ft) main support tower and a boarding station within the O2 Arena car park. When the project was announced, TfL initially budgeted that it would cost £25 million and announced this would be entirely funded by private finance. 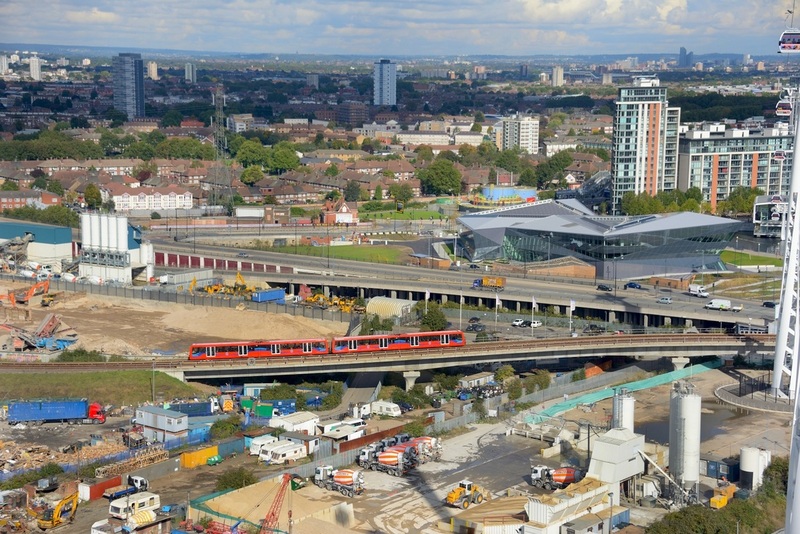 This figure was revised to £45 million, and by September 2011 the budget had more than doubled to £60 million, reportedly because TfL had not taken account of the costs of legal advice, project management, land acquisition and other costs. 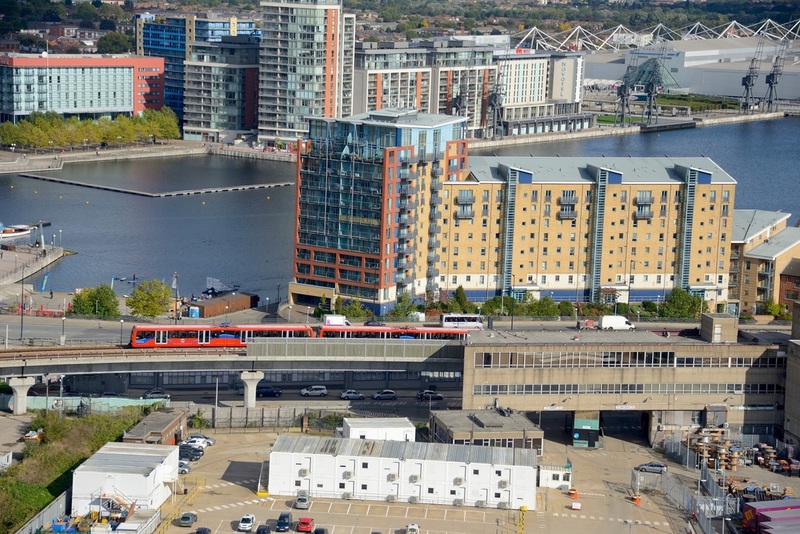 TfL planned to make up the shortfall by paying for the project out of the London Rail budget, applying for funding from the European Regional Development Fund and seeking commercial sponsorship. 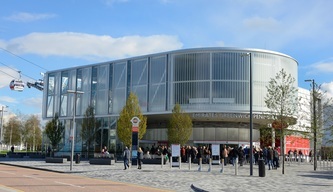 In January 2011, News International was planning to sponsor the project but subsequently withdrew its offer. 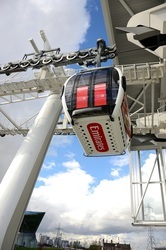 In October 2011, it was announced that the Dubai-based airline Emirates would provide £36 million in a 10-year sponsorship deal which included branding of the cable car service with the airline's name. Construction began in August 2011 with Mace as the lead contractor Mace built the cable car line for £45 million and will operate it for the first three years for a further £5.5 million. TfL stated that the initial construction funding and Emirates sponsorship will cover £36 million of the cost; the rest will be funded from fares. 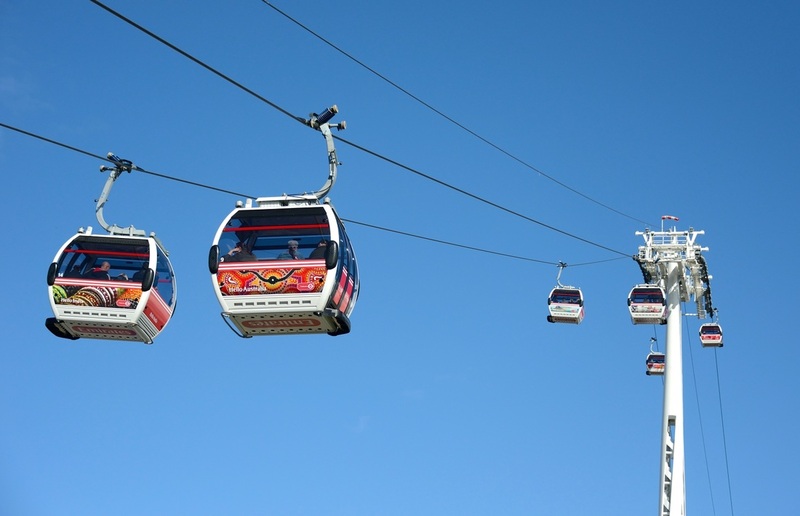 The cable car is the most expensive cable system ever built. 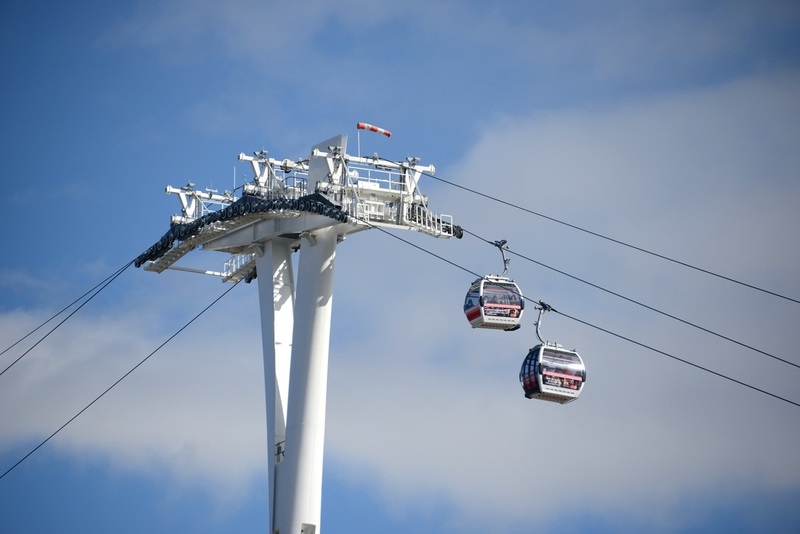 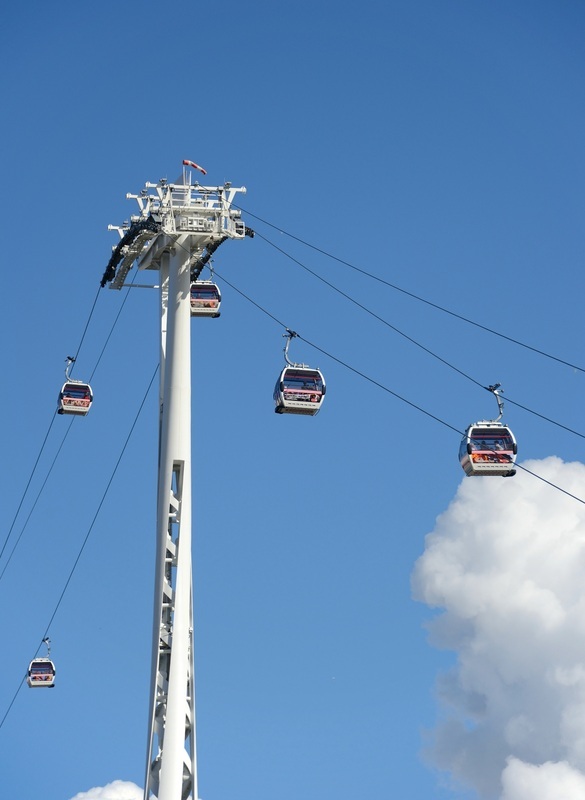 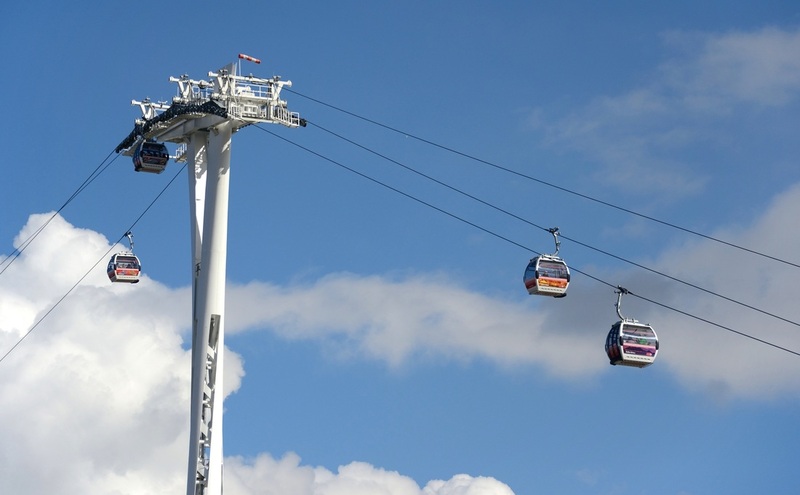 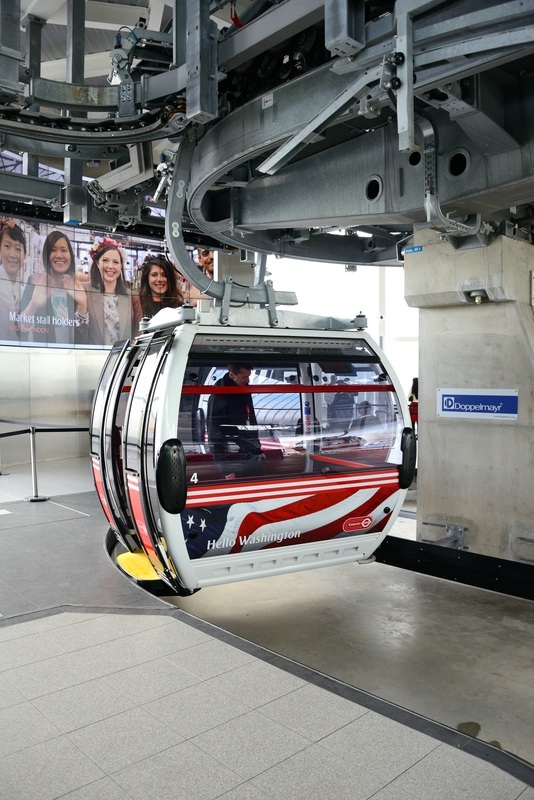 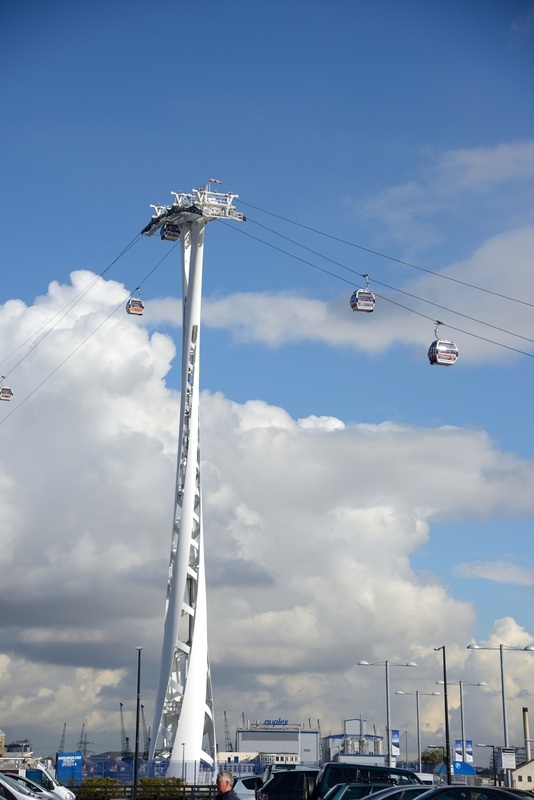 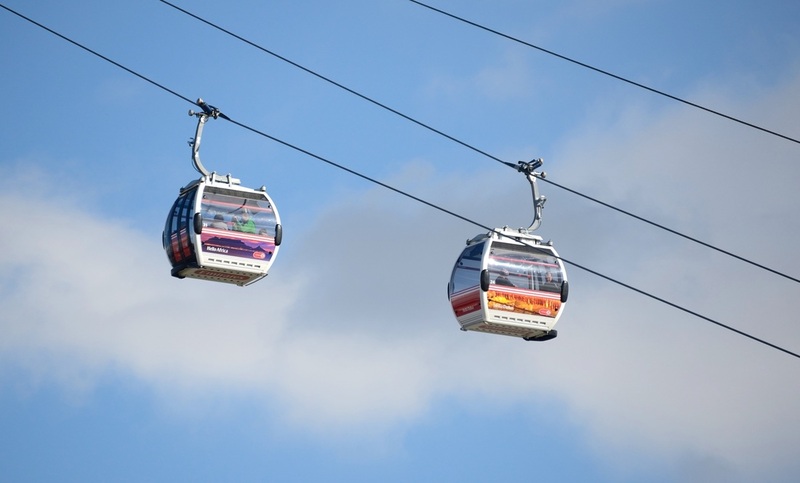 In May 2012, TfL said that the cable car would be ready for people to use by the summer of 2012, and that while there were originally no plans to have it open before the 2012 Olympic Games, there would be plans in place in case it was opened in time. The public opening took place at 12.00 on 28 June 2012. 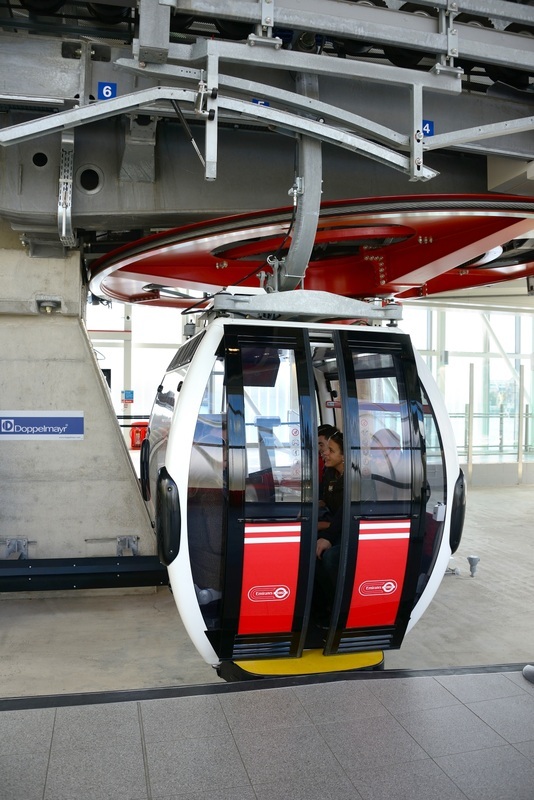 It estimates that the service can carry 2,500 people per hour. 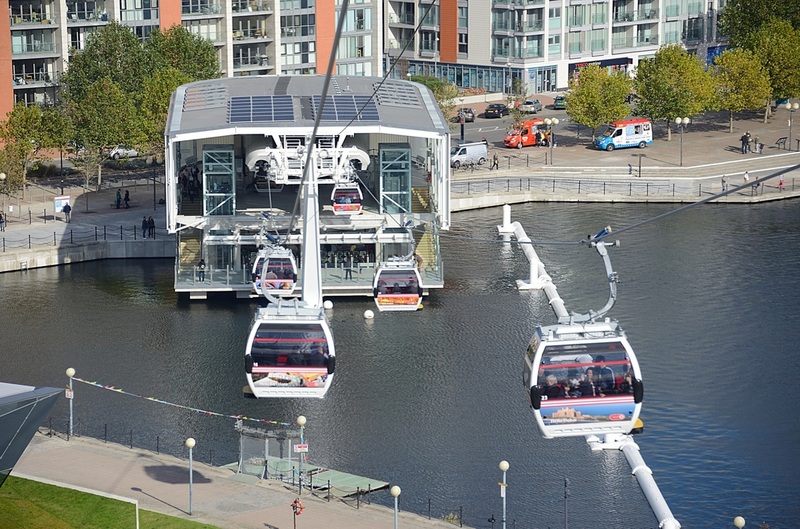 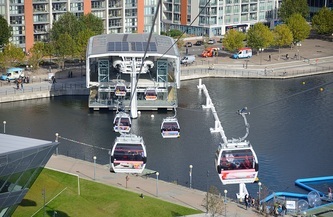 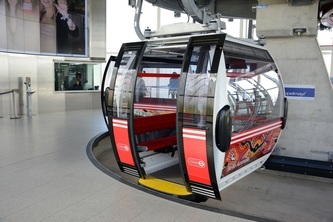 There are 34 gondolas, each with a maximum capacity of 10 passengers. 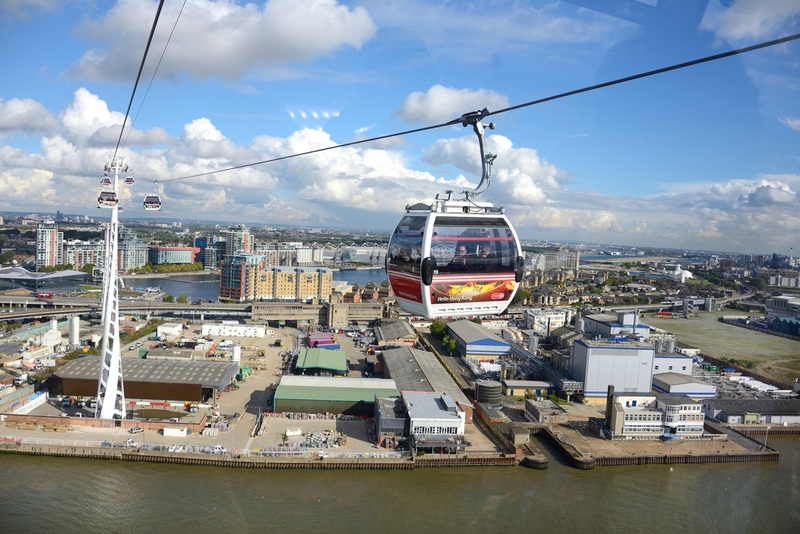 The end to end journey takes 5 minutes in the peak and 10 minutes in the off peak to permit observation of the Docklands area. 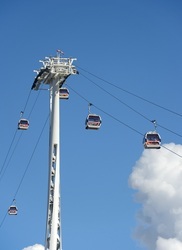 The Emirates Air Line route was put on the London Tube map in June 2012. 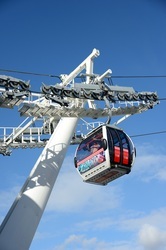 It is the first sponsor to feature a company logo on the map. 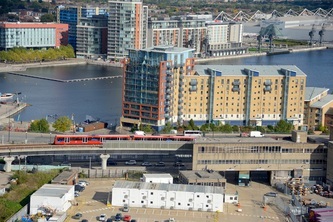 Similar to the presentation of the Docklands Light Railway, the cable car is represented on the map as a triple red stripe rather than a solid line, to distinguish it from Underground lines. 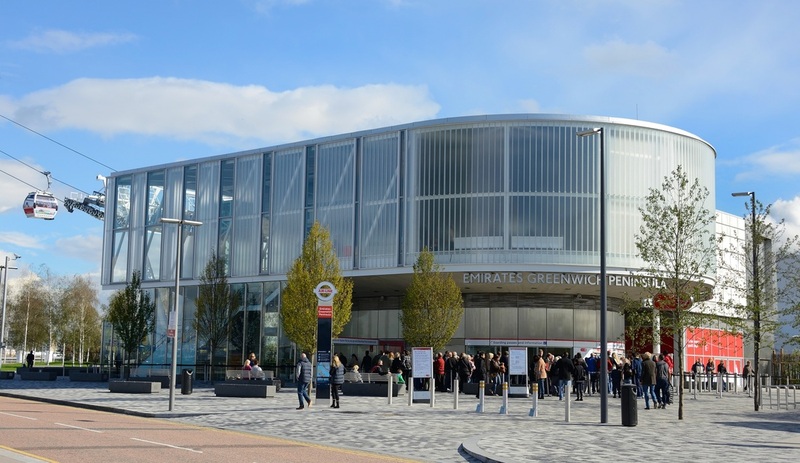 The official logo is a red cartouche shape containing the Emirates logo and the TfL roundel. 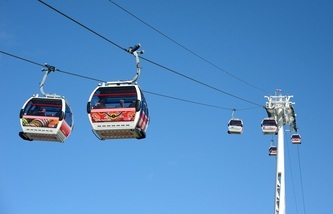 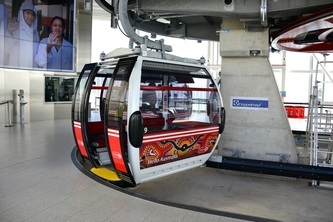 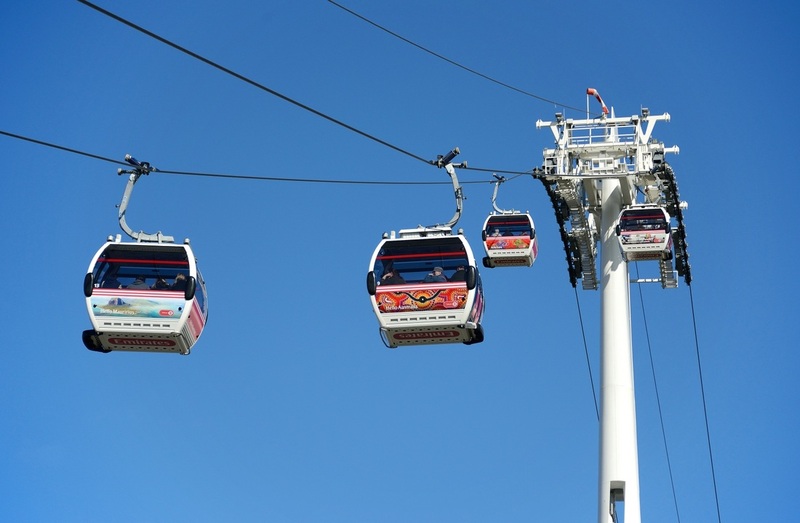 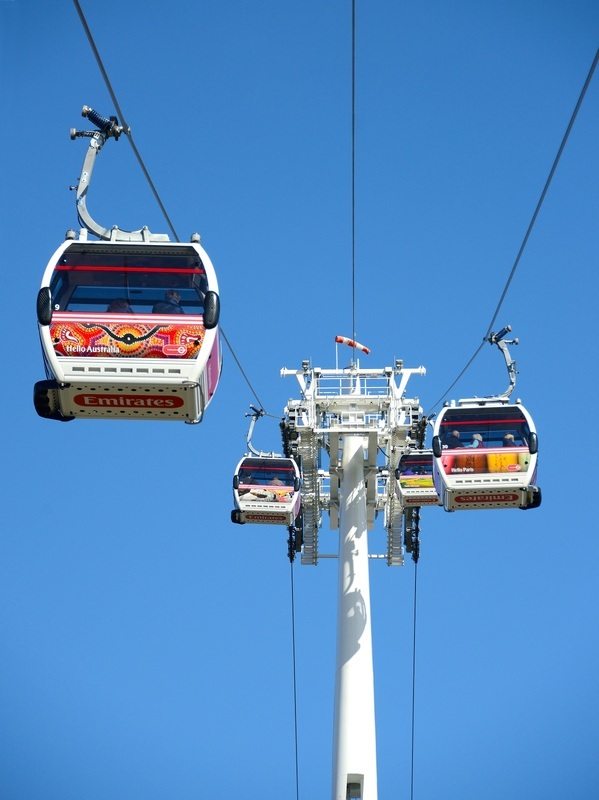 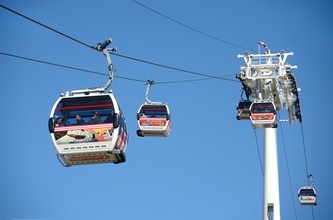 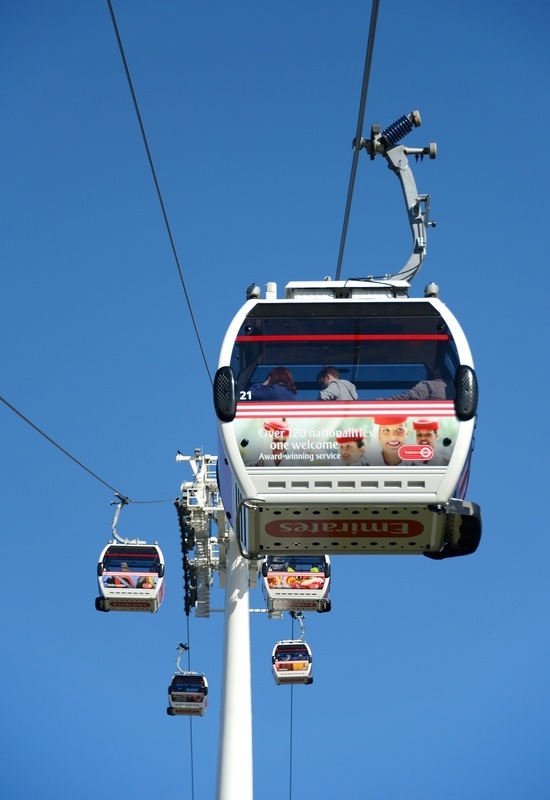 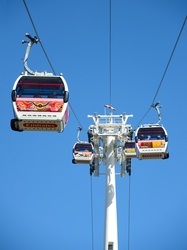 The transit of the cable car is referred to as a 'flight' and marketing literature borrows language from the airline industry, such as referring to tickets as 'boarding passes'. 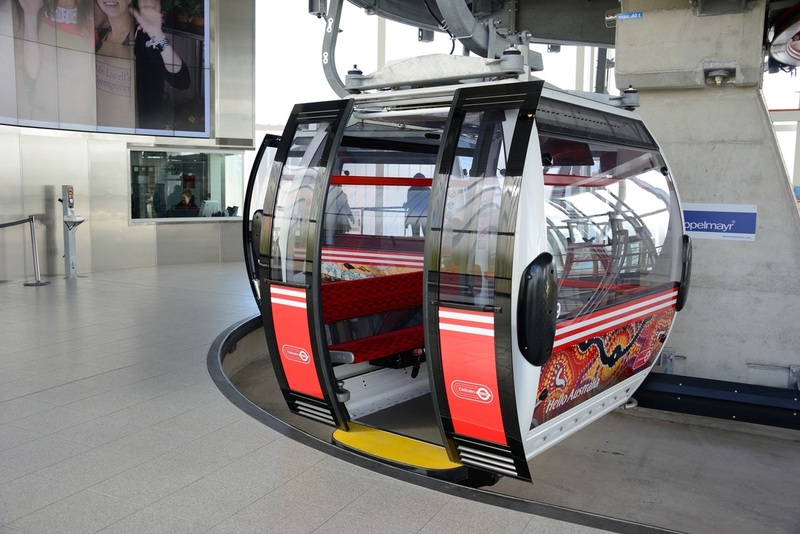 The car wraps were designed by Brighton-based advertising agency, Studio Am. Each cable car represents a different destination that Emirates flies to, with the graphics based on abstract photography to depict the different cities. 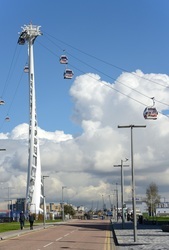 At opening, the fares were £4.30 for a single boarding pass, or £3.20 when paid with an Oyster card or a Travelcard. 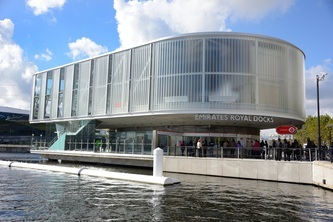 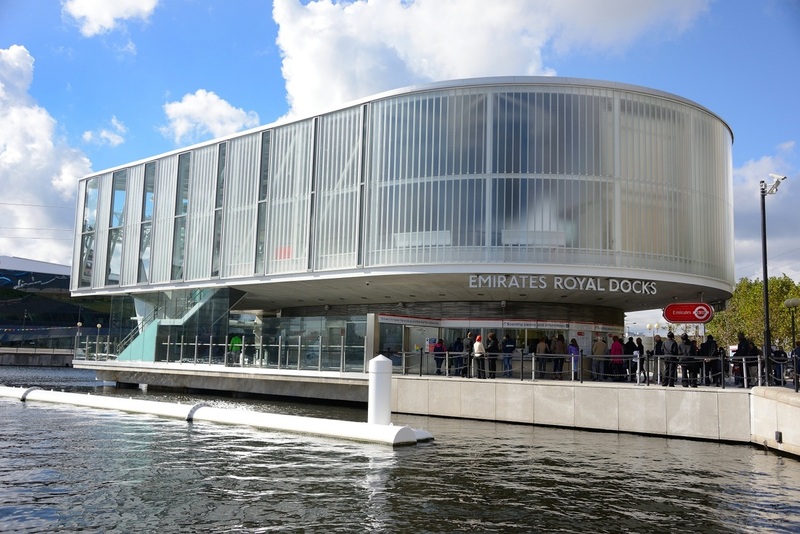 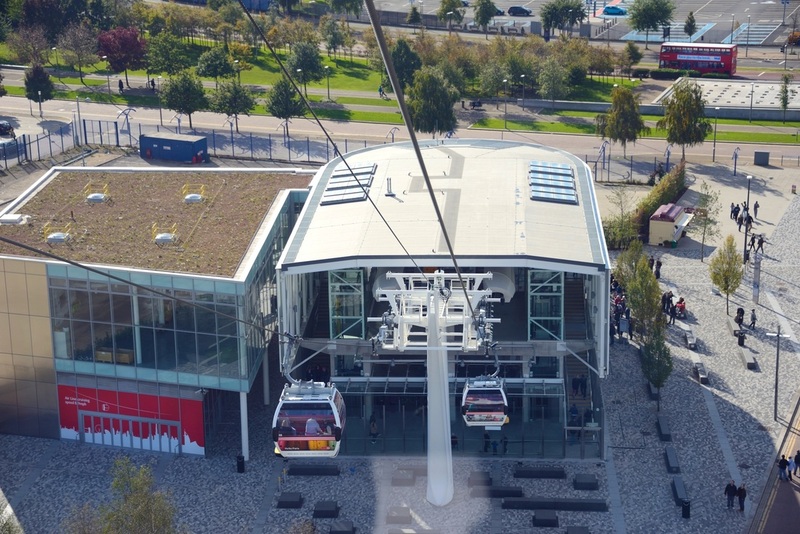 The eastern end of the cable car line is at the Royal Docks, home to the ExCeL The closest interchange to the Docklands Light Railway is at Royal Victoria station. The western end of the cable line is at Emirates Greenwich Peninsula within walking distance of The O2, The closest interchange with the London Underground is at North Greenwich. 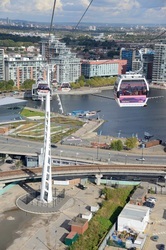 All images recorded on Saturday 13 October 2012. 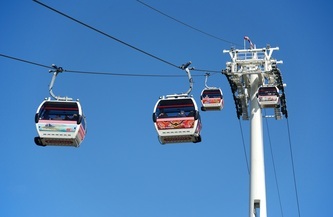 Using a Nikon D800 and 24-300zoom.